Blenheim Palace is a masterpiece of 18th-century baroque architecture built for the first Duke of Marlborough to celebrate victory over the French in the War of the Spanish Succession, in particular the Duke’s role as successful military commander at the Battle of Blenheim in 1704. The palace is set in more than 2000 acres of parkland and formal gardens designed by Capability Brown. Blenheim Palace is home to the 12th Duke and Duchess of Marlborough and the birthplace of Sir Winston Churchill. 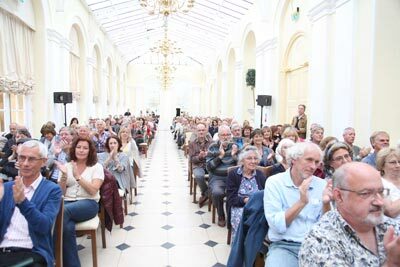 Most Blenheim Palace Literary Festival events take place in rooms at the palace – the Orangery, the Marlborough Room and the Indian Room. The Orangery designed by Vanbrugh is a light and airy room overlooking the Duke’s private Italian Garden. 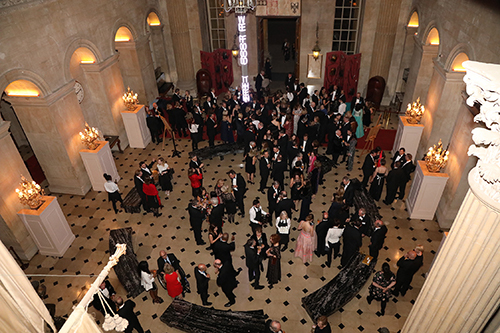 It is a large venue that seats up to 270 for the biggest events at Blenheim Palace Literary Festival and also hosts the festival’s popular black tie literary dinner. It is in great demand as a venue for weddings and receptions. 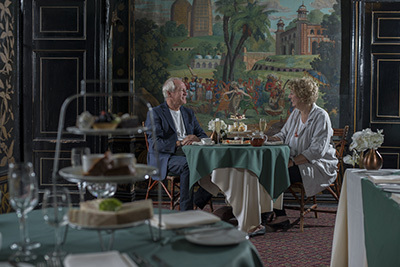 The Marlborough Room was originally the palace kitchen with three huge fireplaces and a double vaulted ceiling. It seats 130 for festival events. It is a popular venue for conferences and smaller dinners. The Indian Room is in a part of the palace that was originally intended to be a grotto. It was never installed and, in the 1820s, the Fifth Duke turned what was known as the Stone Gallery into three rooms. The southernmost was described as a drawing room and contained Japanese panelling and a large mural depicting tiger hunts in India. This room is now known as the Indian Room for its fine Indian-themed murals. It is used as a tea room and restaurant and enjoys views over the water terrace. It acts as a smaller, intimate venue for festival events seating 40. 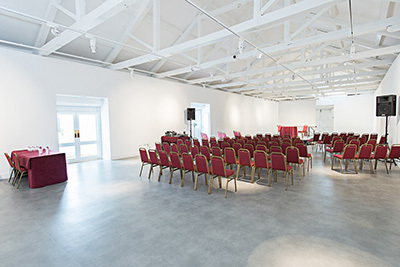 The Gallery is located in the Stable Courtyard and was originally an equestrian centre. It has a beamed ceiling and is perfect for stage productions and film showings. The Great Hall is the magnificent entrance to the palace. 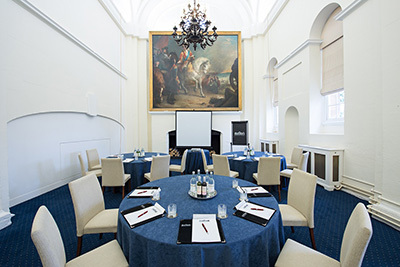 The room is 67 feet tall and is topped by a ceiling painted by Sir James Thornhill representing the successes of the first Duke of Marlborough, John Churchill. The Long Library is thought to be the second longest room in any house in England. 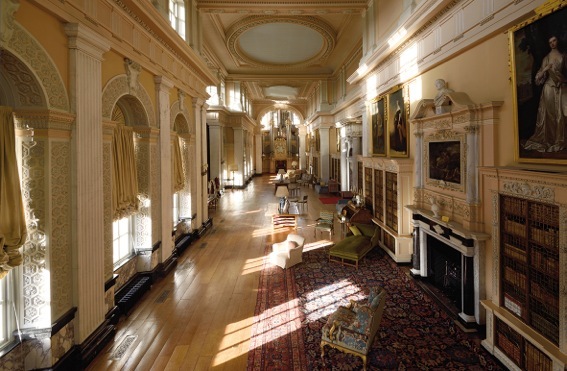 It is home to 10,000 books collected by the ninth Duke of Marlborough. 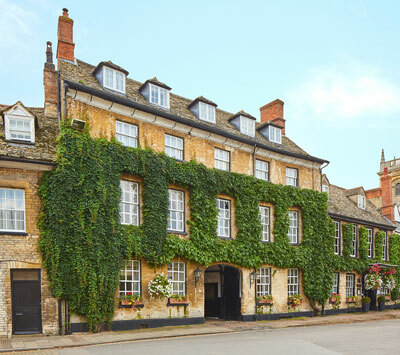 The Macdonald Bear Hotel is a four-star hotel in the centre of Woodstock that was originally a 13th-century coaching inn. It has 54 bedrooms, bar, an award-winning restaurant and meeting and conference facilities.